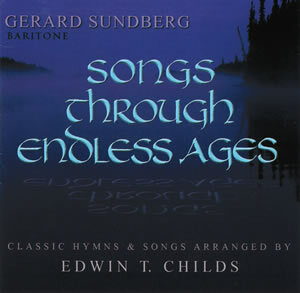 “Songs Through Endless Ages” is a sequel recording to the previous project, “Songs for the Journey.” Baritone Gerard Sundberg continues this tour through sixteen vocal settings of classic hymns and songs that resonate with travelers of all generations. Each arrangement is a totally new setting of an old song and uses various accompanying forces such as string quartet, piano, and organ, as well as descant solos by flute, oboe and violin. The styling covers a range of explicitly classic to proper jazz. As in “Songs for the Journey,” this is musical travel through spiritual territory, and the musicians wish that each song leads you closer to Jesus Christ and, ultimately, heaven.